Our range of mass flow meters from Alicat scientific are suitable for many types of gases and gas applications. Our mass flow meters compensate for pressure and temperature and can output both mass flow and volumetric flow rates. 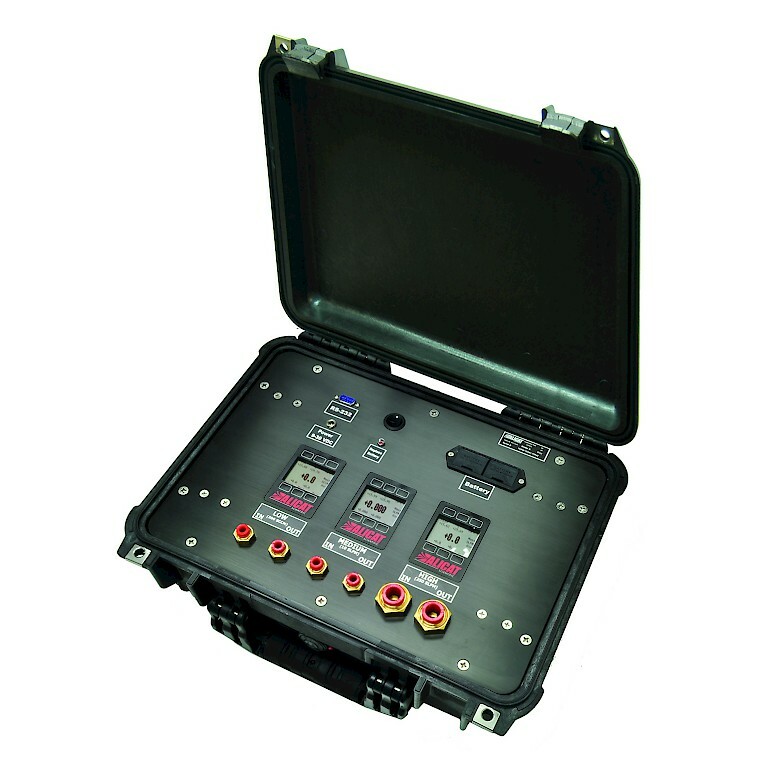 Many variants exist dependant on your requirements, our standard M series model can cover most applications but models also exist for portable use, corrosive gases, ultra-low pressure drop and portable calibration units. Every meter in the range features a local display and keypad for easy setup, analogue output and RS-232 digital communications (others also available). Every meter can also be used with over 80 gases or gas mixtures, you can even add your own. Many manufacturers make excellent products and, of course, back them with a 12 month Warranty. Alicat, however, are so confident in their quality and reliability that they have increased this to an impressive 36 month Warranty. Even more remarkably, however, is the creation of the Alicat Limited Lifetime Warranty. Alicat Gas Mass Flow Meters, Gas Mass Flow Controllers, Liquid Meters/Controllers, Pressure and Vacuum Metering and Control products are all covered under Warranty as per their website. An Alicat mass flow meter is essentially four instruments in one as it can measure, control and output the mass flow rate, volumetric flow rate and line pressure. The fourth parameter is that it will also measure and output the gas temperature. Furthermore, as an option, you can also read the Barometric Pressure should you so wish. 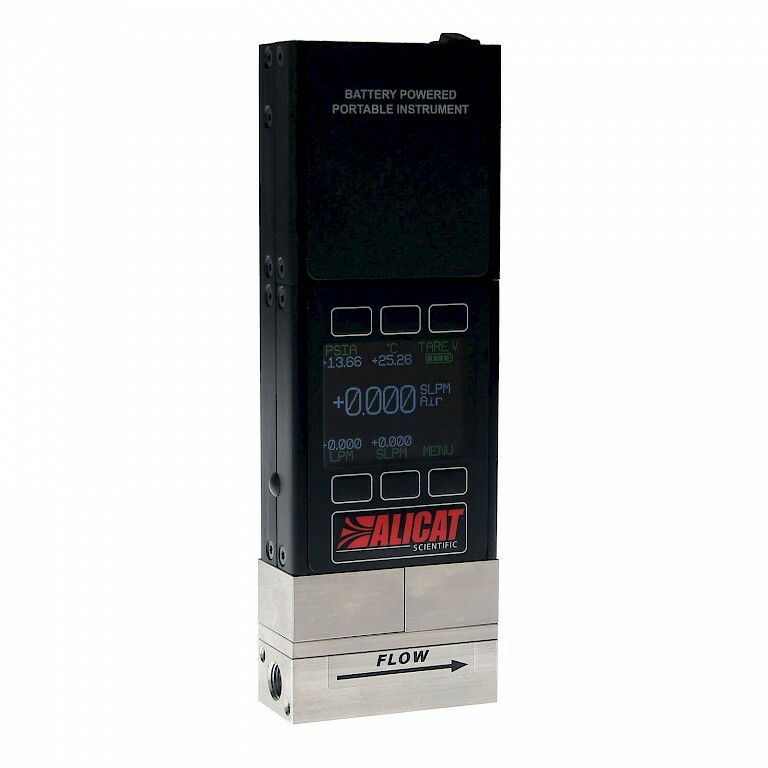 The laminar flow element, differential pressure measurement technique is extremely fast and this when coupled with Alicats’ advanced circuit board design ensures an extremely fast and stable output signal in the order of 5 – 10 milliseconds. 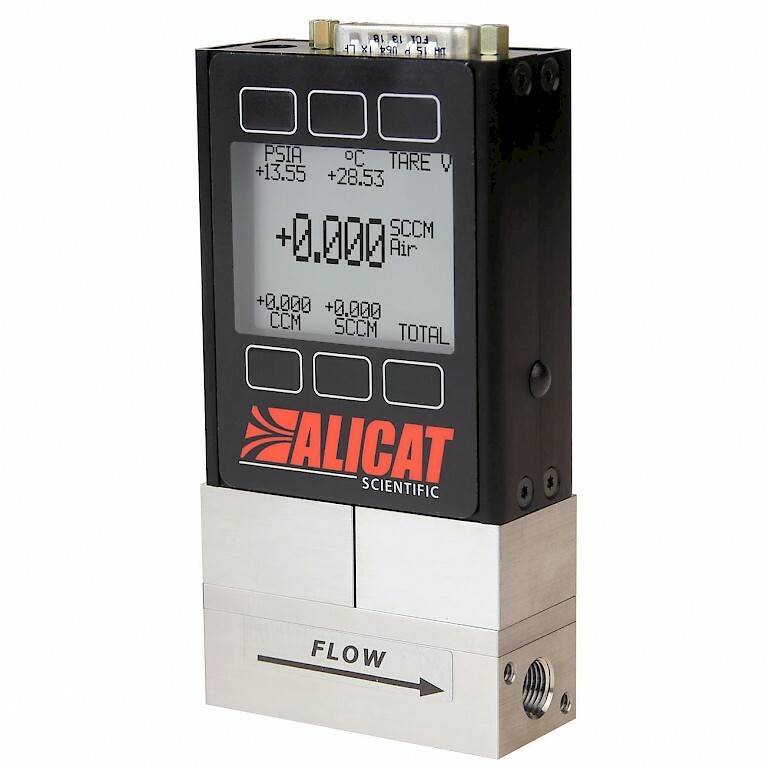 The Alicat measurement technique is inherently bi-directional thus benefitting gas addition or totalization applications within dynamic processes where back-flow is a possibility. Similarly, simulated breathing experiments also benefit from the wealth of data obtained by a single instrument. 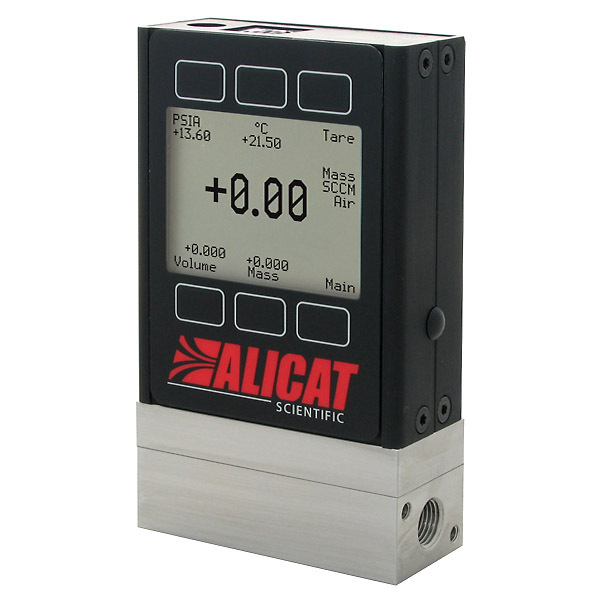 Alicat instruments are pre-programmed with a number of gases (depending on whether they are corrosive or non-corrosive) and a standard accuracy (0.8% Reading plus 0.2% Full Scale or the optional 0.4% Reading plus 0.2% Full Scale) is stated. This accuracy remains true regardless of the gas type selected or the gas mixture created. Perhaps more important, however, is the fact that Alicat Mass Flow Meters do not require conversion factors (or k-factors) that are fundamental to Thermal mass flow meters. These conversion factors add significant measurement uncertainty when a Thermal instrument is used on any gas other than the one it was calibrated with. Why buy multiple instruments to cover your whole range of gases when just one Alicat will be able to measure all of them? Why buy two instruments to cover a broad flow range when one Alicat will do the job for you? Alicat instruments can operate with extremely low inlet pressures or they can be virtually "invisible" within a process. The latter ensures that any flow measurements taken are not adversely influenced by any back-pressure created by the measurement device itself. Don't waste time waiting for the instrument to warm up. Switch on and 1 second later the instrument is ready. Alicat MFM’s can be installed in any orientation. 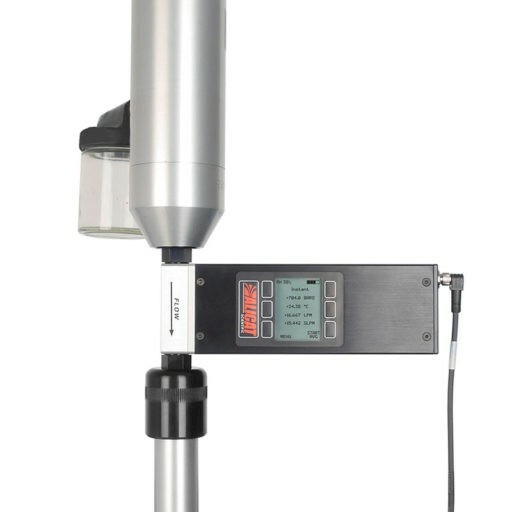 Thermal mass flow meters can suffer from Thermal Cycling ("The Chimney Effect") especially on the so-called balloon gases (Helium and Hydrogen). The presence of non-condensing moisture within the flow stream does not adversely affect the accurate measurement of a gas. It is actually possible to account for the level of moisture as this can be included within a gas-mix composition. There is no need to change out the wiring loom when changing from another supplier to Alicat as the pre-existing pin-out can be copied exact. Alicat Laminar Flow Element instruments have improved upon many of the challenges set by classic orifice plate measurements of volumetric flow being utilized within mass flow calculations. Similarly, they also eliminate the problems inherent within thermal flow designs by addressing hot-wire drift, micro-flow calculations, their response time and the numerous examples given above. Alicat mass flow meters operate on the same principles as many larger laminar transfer standards, but within smaller, easily integrated packages. The operating principle of the volumetric sensor is based on the physics of the Poiseuille Equation that quantifies the relationship between pressure drop and flow. This now shows the linear relationship between volumetric flow rate (Q), differential pressure (ΔP), and absolute viscosity (η). To put this mathematics into practical use, an internal restriction is created. This restriction is known as a Laminar Flow Element and it forces the gas molecules to move in parallel paths along the length of the passage. This eliminates turbulence and creates a state of laminar gas flow beneath the accepted Reynolds threshold of 2000. Next, the differential pressure drop is measured within the laminar region. Finally, the gas temperature is measured as the viscosity of the gas must be calculated by the microprocessor in relation to that gas temperature. In an Alicat mass flow instrument a discrete absolute pressure sensor and a temperature sensor are placed in the laminar region of the flow stream. The sensors send information to the microprocessor which determines the mass flow. A series of calculations is performed and flow rate data is updated an average of 1,200 times per second. 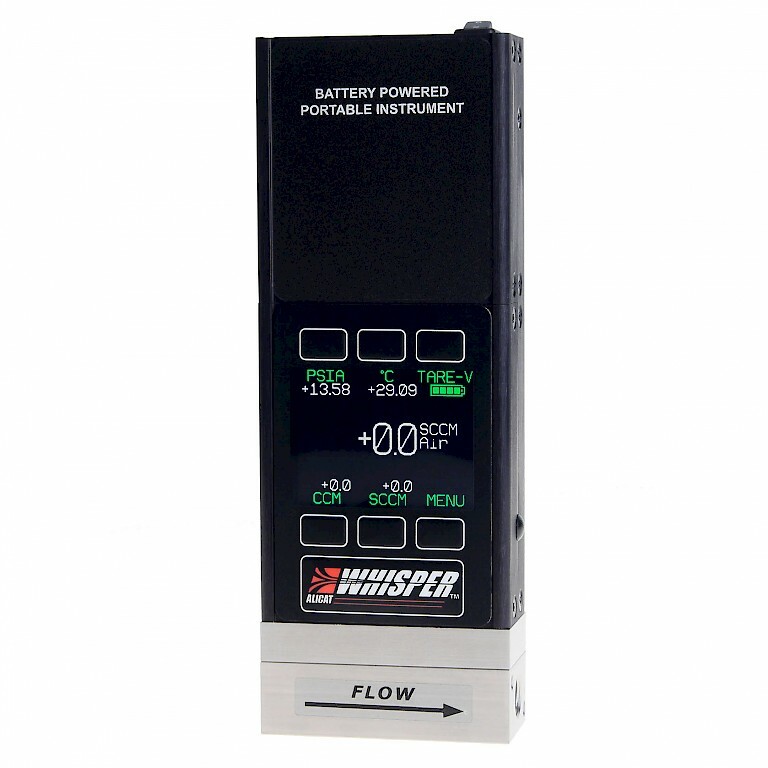 This allows for extremely fast, real time measurements of flow that are sensitive enough to report pulsations in flow as well as step changes. My process gas contains moisture will this harm the MFM ? No, non-condensing moisture up to 100%RH will not damage an Alicat Mass Flow Meter. The presence of moisture will affect the viscosity of the gas so it is advisable to add moisture to the gas mix selectable via the onboard Composer software. This will retain the instruments' accuracy. I have six gases with two flow ranges (full scales of 5 SLPM and 20 SLPM), will I need twelve instruments to cover this? Providing of course that you only require one gas to flow at a time you will only need one Alicat MFM to fulfil all of your requirements. Standard instruments have 98+ gases pre-loaded so with the push of a couple of buttons you would be good to go for each of your gases. 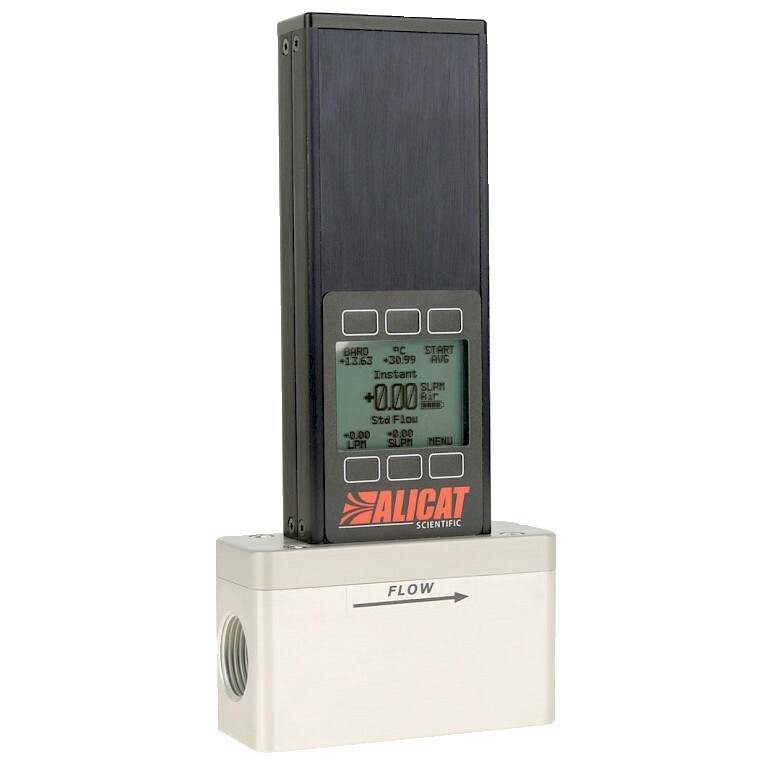 For the extended range of your two flow rates this would be covered by an Alicat 20 SLPM instrument as the 200:1 turndown would allow a lower measuring point of 0.1 SLPM. My application involves the testing of breathing masks attached to a synthetic lung for inhalation and exhalation testing. Will your meter cope? Yes, the Alicat measuring system is inherently bi-directional and so is perfect for this type of application. In addition, we can help with the humidification of air flow to further synthesise "real" breath. My process temperature and pressure will vary by as much as 10%, will this cause inaccurate readings? No, the Alicat measuring system included measuring both the process pressure and the process temperature and so will give accurate readings even as they vary. If you wish, you may want to double check your mass flow readings against your volumetric readings as the Alicat will give you both. My Biogas experiment involves the measurement of the final off-gas with only very low pressure being generated. Will your meter be suitable? 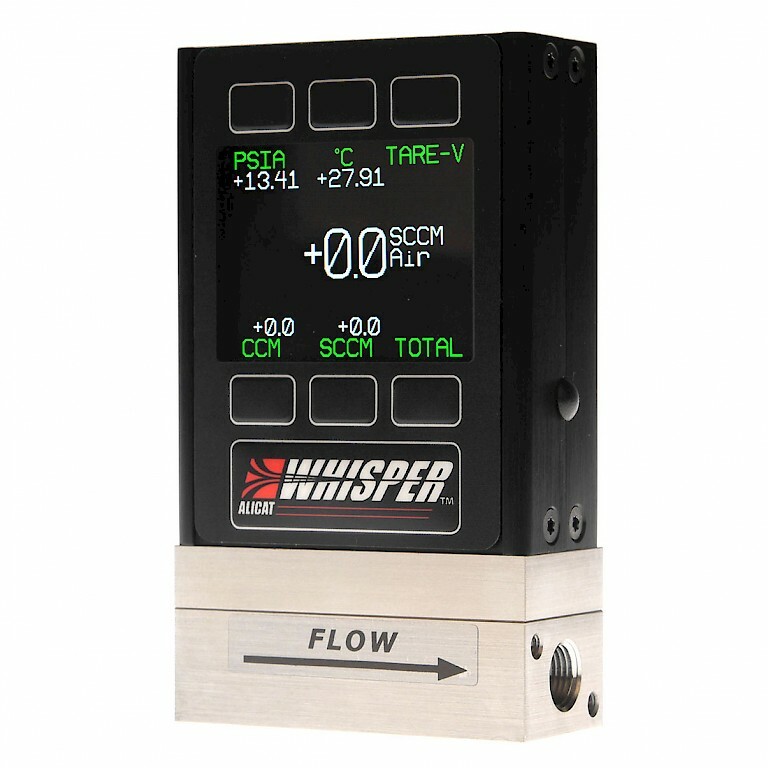 Yes, the Alicat Whisper Series is specifically developed to operate at very low pressures whilst also being virtually invisible within the system; the Whisper will not create an obstruction, or back-pressure, and will therefore not impact the very flow rate it is measuring.